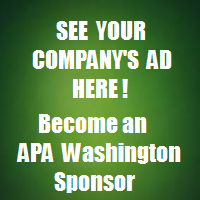 Check out the APA Washington Events Calendar for upcoming planning-related events and activities! Paula talks about the upcoming State Legislative Session, the Fall Conference in Portlandia, and a 2017 Regional Columbia River Forum sponsored by National APA. This year's scholarship winners have focused on climate change resilience and public space design. Working as a planner for a small city requires Laura to be ready to take on a myriad of responsibilities. Meet the board and find out what this section has been up to. To all of the emerging professionals out there-APA-WA is taking steps to address the growing needs of new planners across the state. 2016 Public Owners Forum - Save the Date! Interested in submitting an article for next month's newsletter? View the requirements on our website, and submit your article to our office.